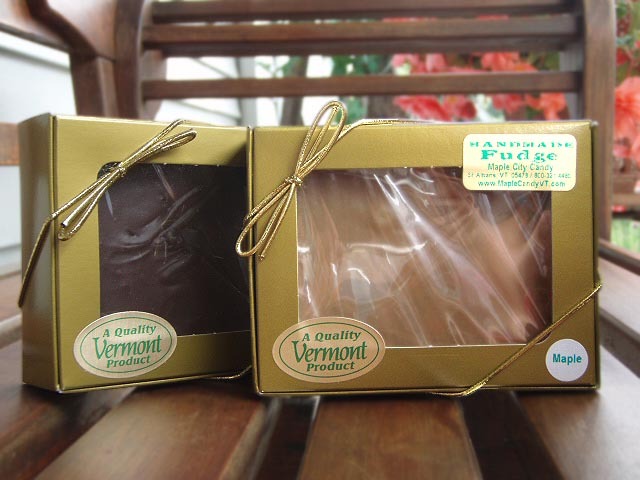 Handmade in Vermont by Maple City Candy. Just like the fudge that you would find in a Vermont Country Store. Comes in an 8oz box ready for Gift Giving. Choose from Maple, Chocolate, Maple Walnut, or Chocolate Walnut. Suggestion: Add one to a Sugar & Spice Create Your Own Gift Basket but don't forget to buy one for yourself.. Yum..
**Maple Candy made in a facility that also produces products that contain; peanuts, tree nuts, dairy, and wheat.